For you eco cosmetics has developed a new, innovative organic sun protection which protects you from the sun and leaves your complexion radiant. The special combination of a mineral light protection filter of titanium dioxide and zinc oxide protect against harmful UV rays. 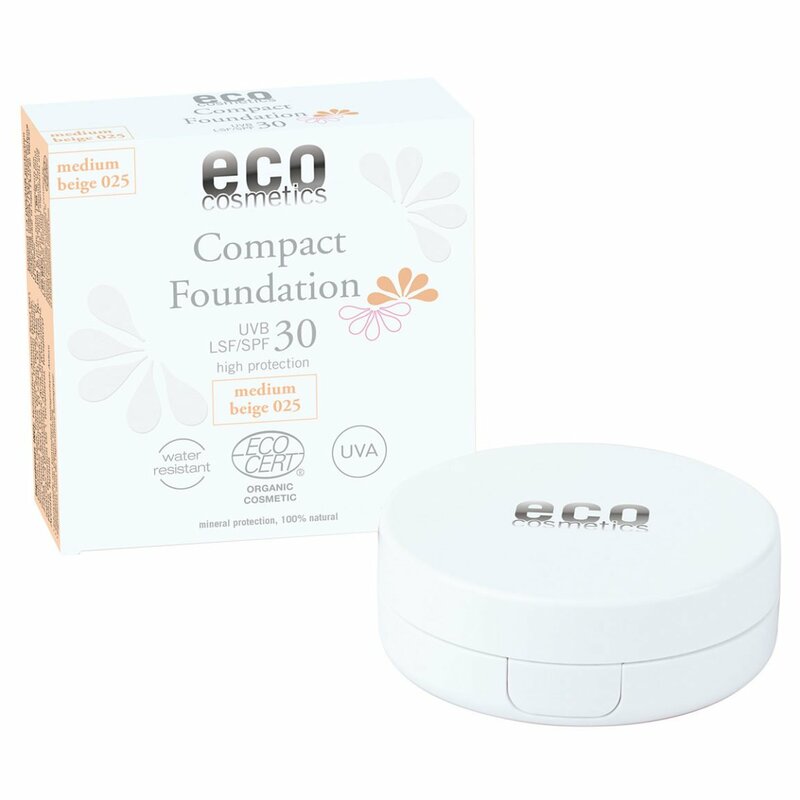 Combined with magnesium and glimmer this UV filter complex forms the basis of Eco Compact Foundation. The toner and light diffusion are able to conceal flaws, dull complexion, dark circles under the eyes and enlarged pores. Eco Compact Foundation evens out your skin tone and lends the skin a natural, smooth finish. The light soft texture feels pleasant on the skin. It is easy to spread and enhances the skin ́s visual appearance. The Compact Foundation with a sun protection factor of 30 is suitable for all skin types and is ideally tolerated. It matches the natural skin tone perfectly and leaves a delicate, natural skin feel without leaving a visible film. Medium coverage, for a natural result. Directions: Apply in the morning following cleansing and your usual day care (e.g. Eco day cream or intensive facial skin cream) with the sponge provided. Apply from the centre of the face outwards, blend the hairline, ears and neck area in well so that no edge marks can be seen. Apply generously and repeatedly before sunbathing, especially after spending time in water. Sunburns must be avoided under all circumstances. For babies and young children use protective clothing and sunscreen products with a high sunscreen factor (more than 25). Sunscreen products with a high sunscreen factor do not, however, offer complete protection against UV-rays. Do not stay too long in the sun even while using a sunscreen product. Excessive exposure to the sun poses a serious health risk. Do not expose infants and young children to direct sunlight. The compact case includes a large mirror and high quality application sponge, making Eco Compact Foundation the perfect companion on travels, too. The airtight, inside container guarantees a longer shelf life as well as product freshness.